"D.C. has had more money than God for a long time, but the outcomes are still disastrous." Which God? I want evidence! How much money did God have? Where did it all go? Did God's children pass the NAEP? Does God feed us coins? Food is a gift unearned, meant to be shared. Does He bathe us in liquidities? The rain and the rivers and the ocean say otherwise. Water is a gift unearned, meant to be shared. Does He manipulate the stocks Pacific Lumber? Shelter is a gift unearned, meant to be shared. Let's keep God out of this--I know it's just an expression, but it's offensive to some, nonsensical to most. We also have to make it easier to get rid of teachers when student achievement isn't happening. Those pesky teachers! You try scrubbing them out, and they just won't go away. Yes, of course, he does not mean all teachers, and yes, of course, by "rid" he simply meant not rehiring teachers who cannot, for whatever reasons, adequately teach. Our students just took the HSPA test last week. Part of the exam focuses on persuasive writing. I wonder how Mr. Duncan would have scored with that response. Photos by Kevin Long of the Associated Press found here. The kiddos are taking the ISAT tests this week (Illinois Schools Achievement Test) and one of their teachers was brave enough to say aloud in the classroom that he felt it was a test that measured him as a teacher not them as students. He's right, especially if we use these tests to scrub out teachers who are trying to teach kids to think for themselves. You know, those multiple choice tests are tough when you have critical readers. Sometimes the answers are not so clear as a, b, c, or d none of the above. He's right, especially if we use these tests to scrub out teachers who are trying to teach kids to think for themselves. I do not fear accountability. I do fear a loss of true public schooling in this country. Word Choice: 1/6 - The man confuses achievement and learning. Poor guy. Sentence Fluency: 5/6 - Complex sentences, plenty of transitions. Mechanics: 3/6 - Not too many mistakes here. However, he did make up words in the past. Voice: 4/6 - Always a little awkward, like watching someone try to get excited while kicking a puppy. But at least he has passion. 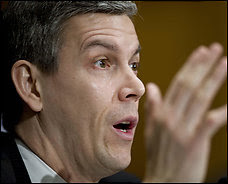 Organization: 1/6 - One second he blames teachers, another he's referring to low-income schools and in another sentence it's a reference to families. It looks like Arne is Left Behind. "This is really a chance to avert an educational catastrophe and to save a generation of kids"
I get nervous anytime someone uses fear to sell me on something. I get angry when politicians try to play Jesus. It's sort-of like adding another coat of lacquer to the deck of the Titanic. Meanwhile, my hope is that I've provided students with a good enough life boat. I almost used that quote, but couldn't figure out why it bothered me so much--you hit the nail on the head! Your grading is hilarious! Must be nice to be able to play basketball--imagine how his life would be different if he had spastic diplegia. Let's say you have a high level, hard working student who, throughout the year, has done everything asked of him/her. This student gets straight A's and helps other students to get their work done. Let's say that the night before the test, the student's home burns down. You think he/she will be focused on that big state test? Nope. Do you think the state will take that into account when grading the test and saying the teacher wasn't doing a good enough job? Nope. Or how about the student who just doesn't care about anything and you struggle to get the student to write his/her name on a test paper? You do all that you can to work with the student, offer extra chances, etc...nothing helps. Think the state will factor that in to your school performance score when the student's test score scrapes the bottom of the barrel? Nope. That's why all this testing mess burns me up. Sure, there are bad teachers out there, but you can't figure them out just by looking at one big test. Just to play devil's advocate, you take issue with his use of a phrase, yet don't our student recite "One nation under G-D" each morning? Doesn't our money say "In G-D we trust". When Mr. Obama was sworn in, didn't he say "So help me G-D"? Where do we draw a distinction? doyle, i've read some of your comments on your post and i'd like to say you have good insight. You make people think. I'm against "In God We Trust" on money (which seems to be the last thing people trust God with). I also don't like "One Nation Under God" in the pledge and I don't like "God Bless America" bumper stickers. I don't like swearing on the Bible (seeing as how Jesus forbid it). No, I'm not Jehovah's Witness either. We didn't start adding God to all the nationalist ideas until 1900. Teddy Roosevelt and Woodrow Wilson both added these concepts to boost popularity among the Bible Belt. Jefferson and Washington would have cringed at them. I believe that "In God We Trust" on our coins is blasphemy. I believe that reciting the Pledge of Allegiance mindlessly every day discourages thinking in school. Blasphemy, however, is our national currency, and thinking will only get you in trouble.